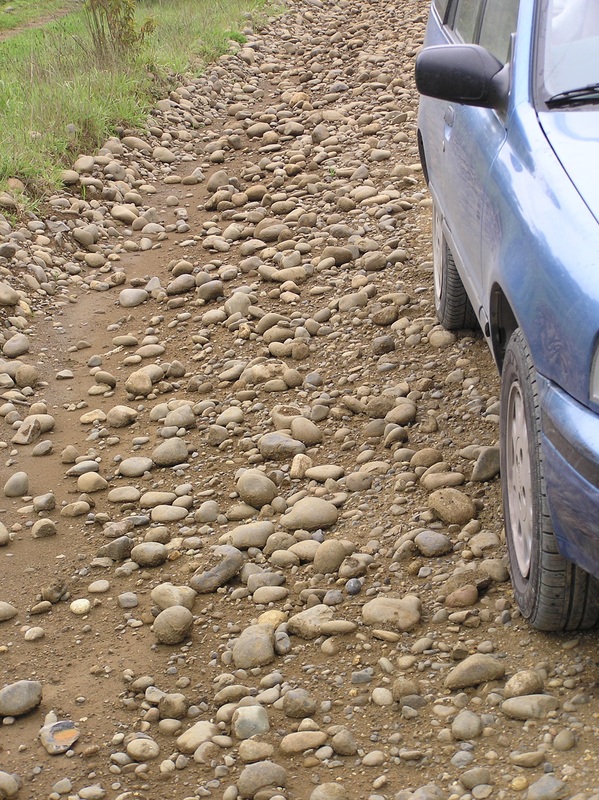 The roads in Chile vary greatly. They range from the major artery the entire length of Chile, and the speed limit is up to 75 miles per hour, to dirt roads where there is no posted speed limit, but you can go not much more than 25 or 30 miles per hour because of roughness. Driving in Chile is on the right side of the road. Ruta Cinco, Route 5, is part of the Pan American Highway and is about 2,100 miles in length. From Peru south to La Serena north of Santiago, the highway is 2-lane and the speed limit is 62 miles per hour. From La Serena, through Santiago and on the Puerto Montt in the south, the highway is 4-lane divided and is of high standard. Ruta Cinco, a toll road, is state-owned but is leased by sections to private companies who collect the tolls and maintain the road for their section. You will often see road crews doing routine maintenance, whether replacing such as guardrails, replacing the road surface, working on bridges, mowing, and so on. Toll is collected every 40 miles or so. It may seem expensive and inconvenient to stop so often, but I can also see that at least some of what I pay is actually spent on the highway, unlike other countries where taxes are collected only said to be spent on roads. The provincial paved roads are not toll roads, but are in good condition. The speed limit is 62 miles per hour. Then there are the dirt roads. Some of those are like driving through a minefield – rough, full of holes, stony in many instances, and are poorly maintained. However, I find the dirt roads to be the most interesting. There, you are more likely to see things that you may not see from a paved road – such as small, picturesque farms, houses on hillsides with nice views across a lake, rushing streams, old bridges, and so on. It is on the dirt roads where you will often find the best subjects for pictures. It is here that you will see how the rural people live. In Santiago, the main thoroughfares are usually in reasonable condition, but some of the streets are rather rough. The same applies to most of the larger provincial cities and towns, however the closer you get to the edge of town, the streets can deteriorate quickly. You will very often see damaged front and rear bumpers on cars. That is mostly due to how close Chileans park near other cars. Sometimes it is a struggle to get out of your parking place due to other cars being so close, side, front and back. If you are being guided into a parking spot by someone, such as a self-appointed attendant looking for a tip, you will almost always be signalled to park much closer to another car than you would if left on your own. Then it is hard to open your car door without hitting the other car unless you are careful. I have yet to see a parking meter in Chile. However, that is not to say you can park for free in some, but not all towns. Some cities or towns contract a private company to collect parking fees. In that case, each block of street is patrolled by an attendant who gives you a ticket dated and with the time when you park. He keeps an eye on his entire block. When you want to leave he will show up at your car and with his little machine, will tell you how much you owe, and issue you a receipt for you. The benefit of this is that it is inexpensive and you don’t have to worry about rushing back to put more money in the meter. It’s actually quite efficient and few parkers get away without paying. I’ve even seen attendants run down the street after a car that hasn’t paid. Was his commission driving away? Along Ruta Cinco, every 30 or so miles there is a gas station which serves the public well. They also cater for trucks. Gas stations will have either a restaurant or a snack bar. Restaurants have reasonable menus and usually are a good enough place to eat. For several miles before you get to a gas station there will be a roadside billboard telling you how many miles (actually it is in kilometres) you have to go. It may even tell you the distance to the next two or three stations. 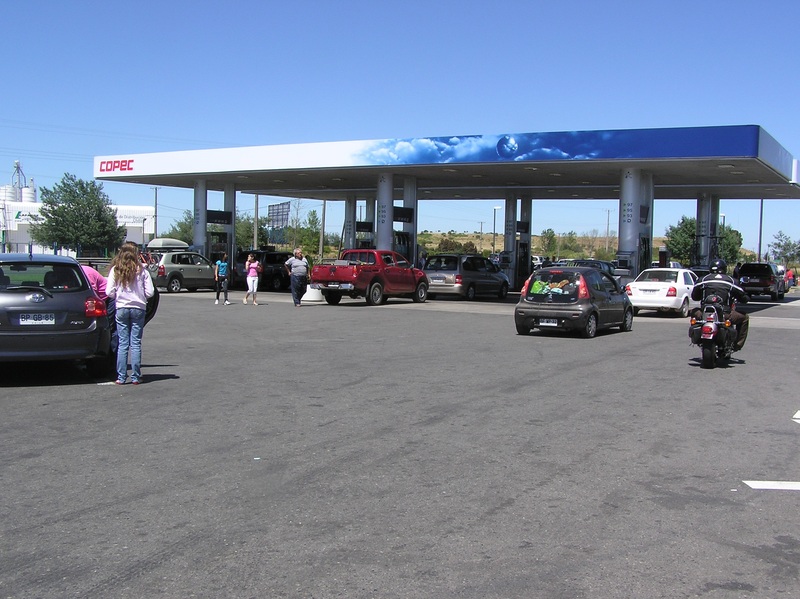 Gas stations in Chile have attendants to pump gas for you, and you pay him at the pump. I have always found the attendant to be polite and attentive. It is customary to give your attendant a tip, which he will appreciate, for I imagine he isn’t paid highly. This is the only place I know of where the usual 10% tip is not the accepted practice. You give what you please, but I usually give him 500 pesos, which is not much, really. The police can stop you at any time along the road and ask for your driver’s license and car papers. Unless they suspect something else, the stop is usually looking for unregistered, stolen, or uninsured cars. Each time I have been stopped, the police have been polite and friendly. The highway police in Chile aren’t sneaky. On Ruta Cinco, at the roadside they will park out in the open their little green-and- white car at right angles to the highway. You will see them quite some distance away. The policeman will stand on the road in front of his car and, wearing a pair of elbow-length white gloves, will signal you to pull to the side of the road. Don’t try to argue the constitutional or other rights of your home country. They don’t apply in Chile. Answer the policeman’s questions and go on your way. And don’t ever, ever, try to bribe a Chilean highway policeman. You will go directly to jail from the roadside. When you drive in Chile you will see the many wonderful things the country has to offer, especially as you progress southward from Santiago into Patagonia. The farther you go the greener and more lush the countryside gets. You will find motels at the roadside or near. They may not be to a standard you are used to, but they will be adequate. Hotels in the cities and towns are available and with varying price ranges. There are also cabañas, small cabins, for reasonable prices. There are also hostels and hostelerias, some of which are excellent. When I am traveling I don’t plan ahead because I seldom know where I will be, considering all my stops throughout the day, looking, listening, taking pictures and so on. When the sun starts to get low in the west, I then start to think about a place to stay and to eat that night. I have always found both but I admit at times it has been a struggle after dark. But my way may not suit you. When you come to Chile you will find no particular difficulty when you are driving. One suggestion I will make to you is that you learn the directive street signs, which are in Spanish and use the metric and European system of signage. Such as, Pare means stop. Siga means go. The city street signs will tell you such as where you can or cannot park. Be sure to learn those, for it may save you some money and considerable headache trying to pay the fine. I learned this the hard way. So, Happy Driving in Chile. Contributed by Tony Reno ~Tony Reno is an anonymous full time traveler currently somewhere south of the equator.